I’ve got to check out for the last two rounds guys, but I’ll write up a late night set of notes as necessary, depending on how the Top 8 turns out. Breakout cards now definitively include: Dig Through Time, Jeskai Ascendancy, Pearl Lake Ancient, Perilous Vault, Siege Rhino and Sorin, Solemn Visitor and possibly Sidisi. Sarkhan, Swiftspear, Mantis Rider, and Elspeth all looked like continuing staples as expected. Stoke The Flames was present in high enough quantities to maintain it’s crazy $4 uncommon price tag. Goblin Rabblemaster and Courser of Kruphix are still in the mix but are not outright dominating as feared. The format is very diverse. So far Top 8 looks likely to include a couple of Jeskai brews, a couple of Abzan brews, a couple of control decks and possibly a Mardu deck. Very diverse with few surprises left to be discovered. In the Orange (Esper Control) vs. Watanabe (Jeskai Burn) match, Orange dropped an Ashiok, one of the first we’ve seen this weekend, and he’s up a game. Running 4 copies of Sidisi, Brood Tyrant + 4 copies of Whip of Erebos (!) and a single Soul of Innistrad in the main. Now we’re looking at the first appearance on camera of Sidisi Whip, featuring Soul of Innistrad + Sidisi, Brood Tyrant. Deck pilot is 10-3 and still live for Top 8. An appearance like that would push both of these mythics up the list. Owen takes down Oiso and makes Pearl Lake Ancient look even better. Floch beats Brad Nelson, putting 2 UB players in line for Top 8. Pearl Lake Ancient getting more camera time. Ebay checks show copies going for about $4 shipped now, up ~75% since start of the event. Clever Impersonator on camera doing some work. Also worth noting that Oiso is running Prophet of Kruphix. Look for foil Clash Pack versions to climb if this deck makes Top 8. Levy defeats Cuneo, highlighting Mardu Planeswalkers as a deck to beat. Levy calls the deck grindy and calls Chandra a key source of advantage. Refers to Sarkhan emblem as key in victory. Zack just called out Dig Through Time as the breakout spell of the tourney. We concur. Innovative Shi Tian deck also seems to have Polukranos out of the board! Shi Tian is playing transformational Jeskai combo, choosing to use Savage Knuckleblade against McClaren on Jeskai burn post-board. Good camera time for the Temur monster could help keep it in the $4-5 range. Pearl Lake Ancient getting more top table air time. Not feeling ultra confidant on the prospects, but I like a few sets under $2. Helen announces that Regional PTQ participants will be receiving Liliana of the Veil just for attending. This card just turned into a sell signal but distribution isn’t until April 2015 so I’m a buyer below $40/copy. Day 1 of Pro Tour Khans of Tarkir featured 3 fascinating rounds of draft, followed by 5 highly varied and exciting rounds of standard action. So far the field is strongly diversified but at the end of the standard rounds, the theme was clear: Jeskai and Abzan own this tournament. 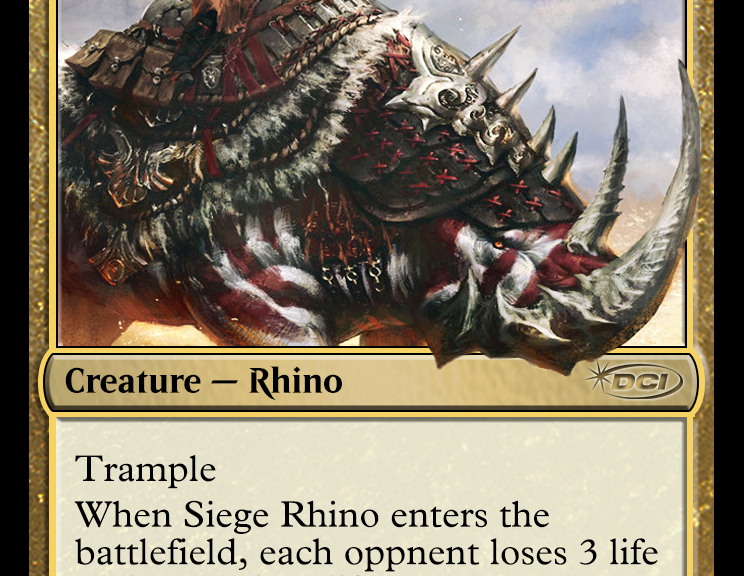 Mardu Planeswalkers, Green Devotion and G/B Constellation builds also still have a shot, but it’s the Ascendancy and Siege Rhino decks that need to be overcome on Day 2 to win through. See all of our Day 1 coverage here. If there is a break out card this weekend so far, this is it. Jumping this week from $3-4, to as high as $17/copy Friday night, it’s now running in our predicted $10-12 range. A future in Modern and Legacy will only help ensure that this card locks into the top 10 cards of the KTK for the foreseeable future. It’s unprecedented. A tri-color rare combo piece that is seeing widespread play in Aggro, Tempo/Burn and Combo decks all in the same format! That flexibility, manifesting with Jeskai as the highest percentage (20%) of the field, along with a couple of Turn 4 kills on camera Friday night, has pushed the card up towards $10 overnight. If it shows up in 2-4 decks in the Top 8 it should easily hold that price until the meta shifts. In at $3, I’m already a seller at these levels, holding back a playset for standard use. With Mardu showing up as the 2nd most played deck of the tournament, Sarkhan seems relatively secure in his role as the most expensive card from Khans of Tarkir. Missing Day 3 could result in a $5-10 slide, but a Top 8 finish should further cement bid red on the throne. Sorin is an early success story at this tournament, showing up in both Mardu and Abzan decks and making a strong case for an upswing towards $30. If Sigrist makes Top 8 with his Abzan deck (and it looks very possible), Sorin should top $30 with room for growth. Largely overlooked up to this point, the Aggro Abzan build needs this guy as a phenomenal 2-drop in place of the eschewed Sylvan Caryatid. Speaking of Sylvan, I’m a seller above $15 at this point, unless a green ramp/devotion deck playing the card makes Top8. This bulk mythic is now on deck for gains, showing up as the finisher of choice alongside Prognostic Sphinx in U/B control decks. Hype is still low, so a top finish is necessary to pull this up to the $3-4 range where getting in around $1 would be seen as worthwhile. This casual favorite did show up in the sideboards of the U/B Control builds run by Pantheon and others, but failed to gain any strong camera time. Current price level should stay steady. The Hornet Queen is all over the tournament acting as the finisher of choice in multiple devotion decks. Playsets are running $20-$26 this weekend, and there is room for growth on par with Rabblemaster if it makes Top 8 in multiples. They’re in play at every table, but very few decks are running more than 4-6 copies. I’m calling these to fall further on schedule, down below $15 by the holidays. The Rabblemaster is showing up in force, but with so much recent growth, it will need a Top 8 showing to avoid a possible slideback in price. I’m a seller at current levels, happily reinvesting in other options. It’s getting played in Abzan and Mardu decks in as many as 4 copies. A strong Top 8 showing could see it push over $16 from the current $10-12. Sigrist called it out Friday night as the “best card, no contest” in his 5-0 Abzan Aggro build. If it makes the top tables, expect a bump towards $10. Previous PostPro Tour Khans – First Two Rounds UpdateNext PostAdvertise to 150,000 magic players!